HAPPY NEW YEAR! Hope everyone had a great countdown and are well-rested during the festive holidays, fully recharged for 2017! 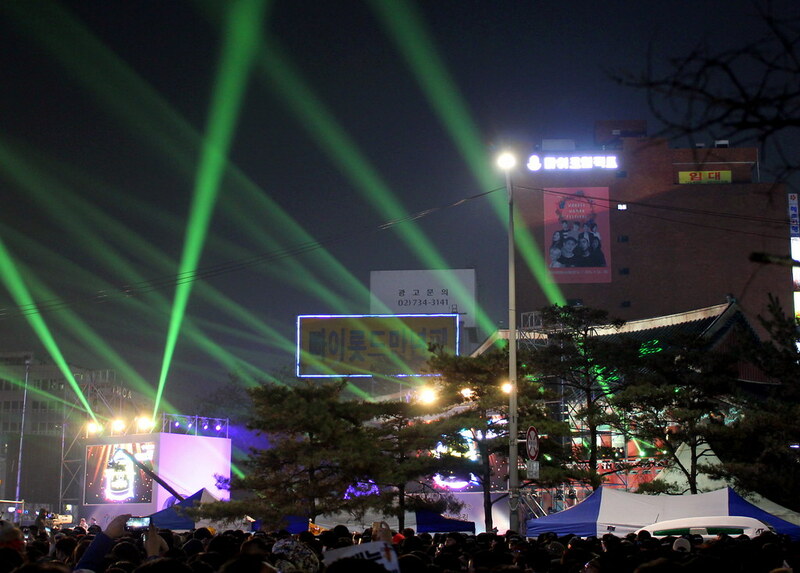 Together with my other half, we spent Christmas and NYE in South Korea’s capital, Seoul. I’ll start with sharing my experience counting down traditionally with the locals at the Bosingak Belfry. During the Joseon Dynasty, Bosingak Belfry was used to tell the time. There were four main gates in Seoul that enabled people to travel in and out, and the ringing of Bosingak Bell was used to signal the opening and closing of these gates, namely Sungnyemun, Heunginjimun, Sukjeongmun and Donuimun. There were also four other smaller gates – Hyehwamun, Sodeokmun, Gwanghuimun and Changuimin – in Seoul since the 5th year of King Taejo during the early Joseon Dynasty. At dawn, the bell would ring 33 times at approximately 4am to signal the end of the night curfew and the start of the new day, hence the opening of the gates. But, why ring it 33 times? This practice was influenced by Buddhism as the Buddhist Goddess of Mercy manifests herself in 33 different forms in order to save mankind. At around 10pm, the bell would ring again, only for 28 times, to signal the end of the day and start of the curfew, hence the gates will close. Tracing back to ancient times when the universe was divided into four “gungs” of East, West, South and North, and each “gung” was further separated into seven, therefore forming 28 gu/su of constellations, which resulted in the tradition of ringing the bell 28 times. The bell served as an important signal at that point of time but was melted due to a fire accident. It was remade in 1468 and now sits in the national museum. The bell that replaced it in Jongno was made in 1985 and the Bosingak Belfry was built in 1979, usually restricted on normal days. Originally known as “Jongnu” (bell pavilion), the bell was named Bosingak Bell in 1895 during the 32nd year of King Gojong. Nowadays, you’ll never be able to hear 33 rings on a normal day, with the exception on New Year’s Eve every year, where a special ceremony is held, and the bell is rung 33 times in front of large crowds. Bell ringing on NYE symbolizes the end of a year, and in a way, wish for blessings, good health and the happiness of the citizens for the brand new year. 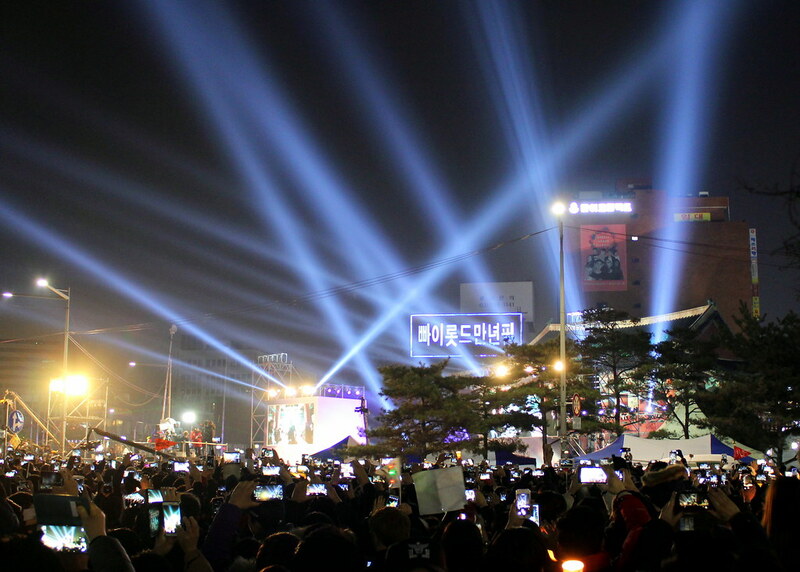 We tried to check a couple of places where there will be fireworks display in Seoul for NYE countdown, but were told that many places decided not to have it. 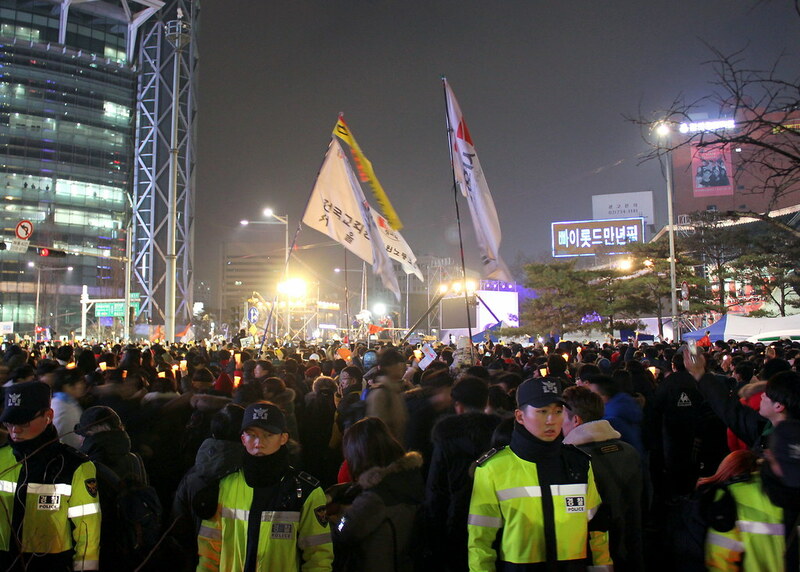 We’re guessing it might be due to the demonstrations ongoing regarding the impeachment of President Park Geun-hye. We were caught in the midst of a demonstration when arriving at Bosingak Belfry but prayed hard that NYE countdown would still carry on. 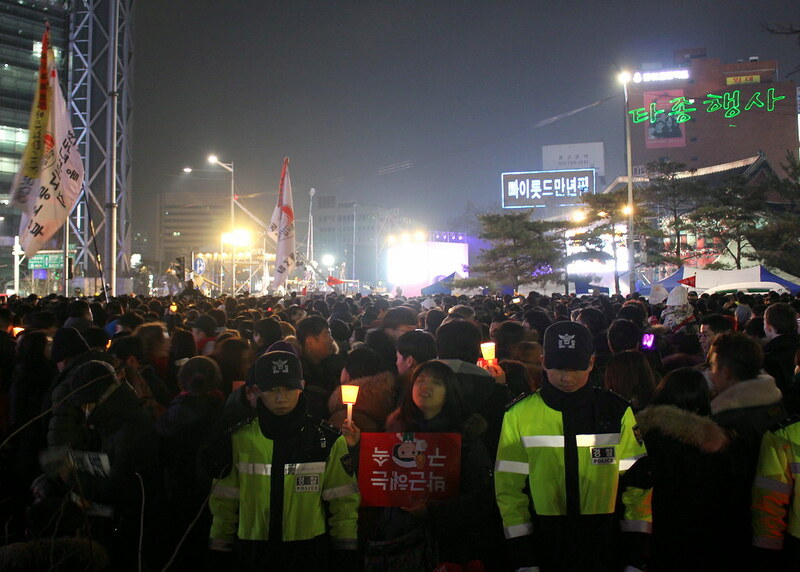 There were large groups of people holding up flags and banners and lighting candles while carrying them around. Thankfully for us, around 11.40pm, the counting down programme began. The dignities walked the red carpet to the bell and were introduced before they proceeded to countdown with everyone. We counted the number of rings when the bell was rung but it fell short of 33 rings … We wonder why! So, 10 minutes after counting down to 2017, the demonstration we witnessed resumed. We were really taken aback by the abrupt change of mood and emotions portrayed by the locals and hurriedly evacuated the area. This was an once-in-a-lifetime experience that we don’t want to repeat. We recommend you to sling your bags and carry your backpacks in front. It’s best to head there with minimal valuables. Our experience wasn’t a good one as the locals, especially the middle-aged men, were impatiently pushing and shoving their way around. It’s alright if you’re tall, with a big built but petite-sized females would suffer. I had a hard time trying to breathe while making our way to the subway station after the countdown. If you think Singapore’s MRT peak hour situation is bad, it’s nothing compared to the rude and impatient Koreans that we encountered during NYE. That said, it may just be our luck being in such a situation on NYE but overall, the Koreans we approached during our 10 days vacation were very helpful and even though their English is limited, they tried to help us with sign languages or even, Google Translate! We can never forget an Ajumma (aunty in Korean) who served us really delicious snacks at one of the traditional shops at Bukchon Hanok Village. There were no seats so we braved the cold and stood outside her shop to finish the snacks. She even offered us hot coffee! Such a kind lady! Kamsahamida Ajumma! Overall, we really enjoyed our Korea trip and explored many places of interest such as Gyeongbokgung, Changdeokgung, Nami Island, Petite France, and Garden of Morning Calm, just to name a few. I’ll be sharing more information and traveling experience with you in the upcoming posts. Till then, have a great weekend! Directions: The easiest and nearest way is to alight at Jonggak Station (Line 1) and come out from Exit 4. You’ll be able to see Bosingak Belfry from Exit 4. However, this station will close between 11pm to 12am due to crowd control on NYE. So, other options include alighting at Euljiro 3(sam)-ga Station (Line 2) Exit 3, Jongno 3(sam)-ga Station (Line 3) Exit 15 or Gwanghwamun Station (Line 5) Exit 5. These are of walking distances from Bosingak Belfry and it’s hard to miss due to the massive crowd. Hi! This sounds really cool! I was wondering what time you got to the Jongno bell ringing, and how busy was it? Is there a certain time you suggest going? 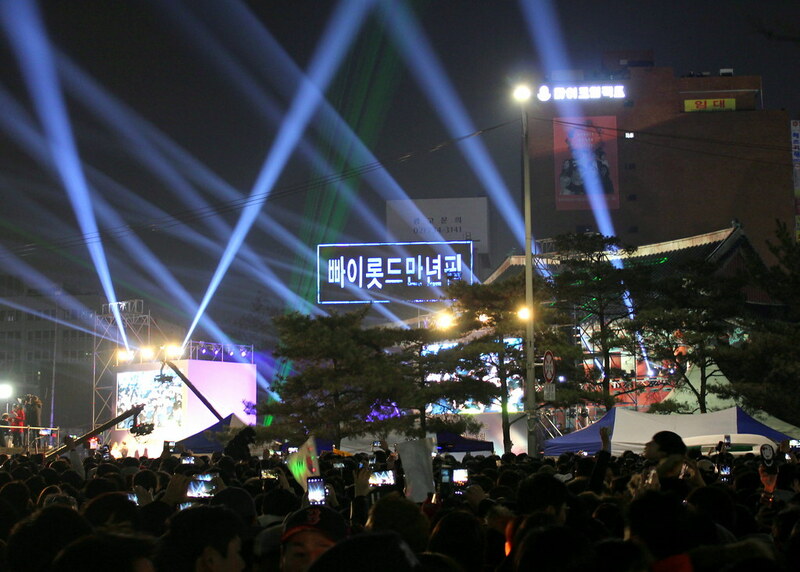 Hi KaiMei, we arrived at the Jongno Bell area around 11.15pm and had to squeeze our way to a higher ground to witness the event. It’ll be good to arrive earlier if you want to avoid the crazy crowds at the train stations.